Image caption Jaromir Balda (centre) said he "did not want to commit terror"
A Czech pensioner who felled trees to block railway lines and then pretended Islamists were responsible has been jailed for four years for terrorism. Jaromir Balda, 71, left messages at the scene proclaiming "Allahu Akbar" - or "God is great" in Arabic. Two passenger trains hit the trees, but nobody was injured. On top of his conviction, the court ordered psychiatric treatment for the far-right sympathiser. He said he hoped to spread fear of Muslim migrants. "I did not want to commit terror, I wanted to resist it," he reportedly told the regional court in Prague. Balda also said he was confused by blood pressure medication he was taking. The retired electrician left the trees on tracks near the city of Mlada Boleslav, about 30 miles (50km) north of Prague in 2017. Nine passengers were on board the first train, while the second - with six passengers and three staff - hit the tree at 80km/h. An expert reportedly said it was lucky the trains did not derail. The notes he left at the scene of the crime suggested future attacks on Czech soil and called for violence against "Czech unbelieving dogs", news website Novinky.cz reports. 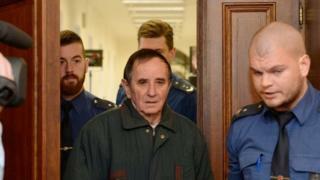 Local media pointed out the irony of an elderly Czech man seemingly radicalised by anti-migrant rhetoric being among the first in the country to be convicted of terror offences.